Anyone familiar with Pope John Paul II is aware of the massive amount of young people who swarmed to World Youth Day events, primarily because of their attraction to this Holy Father who conveyed his great fondness and love for, and hope in them. In Poland, long before World Youth Days were in vogue, this same priest and eventual bishop, and then cardinal invested himself in youth, offering his time to them on myriad kayaking and hiking trips away from the city and away from the eyes of the communists who prevented the clergy from interacting publicly with youth. The camping trips were, of course, supplemented by Mass and the sacraments and lessons in living a Catholic life. The youth of Poland were indebted to him–for his belief in them, for his presence among them and for his love for them. (Scroll to the end of this update to hear St. John Paul II sing the Pater Noster after several photos are shown of him. John Paul sang the Pater Noster at the inaugural music festival. Those videos have all been lost, but in this YouTube, in 1979, an older John Paul sings it again, and it is so beautiful! 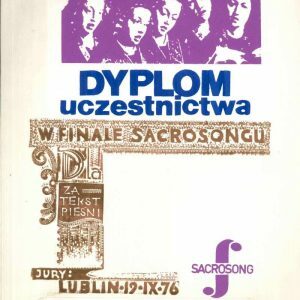 This famous Polish music festival was begun in 1969. 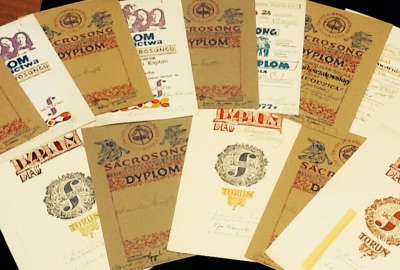 Participants were issued diplomas for their participation, Papal Artifacts is fortunate to have one from the inaugural year. Pope John Paul was supportive of this festival as a young Cardinal in Poland. 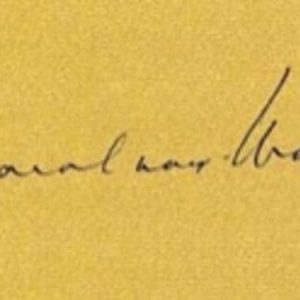 His signature is in the center of the document: Karol Cardinal Wojtyla. 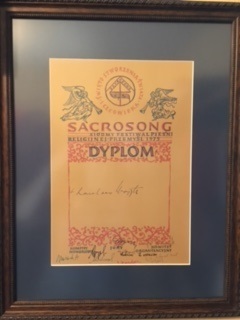 The diploma measures 11X17 and is hand-painted in silver and cobalt blue with calligraphy. It is in nearly perfect condition and a very beautiful addition to the Collection, because of John Paul’s signature and because it adds another dimension to the life of our most recent saint. 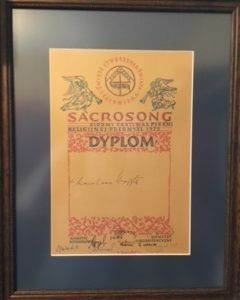 Recently we were able to obtain a cache of Saint John Paul II signed diplomas from the Polish music festival Sacrosong. They range in dates from 1973-1976. 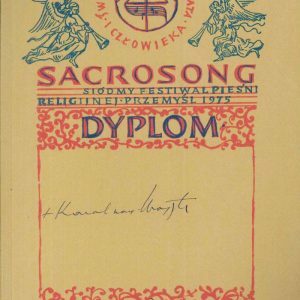 Any autograph of the great saint is desirable, but an autographed document directly associated with a Polish cultural movement that helped preserve Catholic identity in Poland during the Cold War is uniquely historical, especially when signed by the future Pope, Cardinal Karol Wojtyla. These will be available only while the documents last. Please use the Contact Us option on the website to inquire for further details. Concerned about the world peace we would like with God’s holy assistance to raise the interest of the Secretary General of the United Nations in the promotion of the intercontinental day of the creation of the world and human. It was the idea of a renowned Polish writer, Antoni Gołubiew. 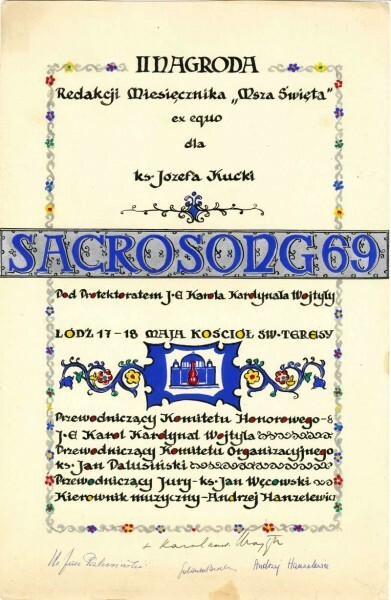 This initiative met with the acceptance of the former Pope, Karol Wojtyła. It was Rev. Jan Palusiński who took it upon himself to realise of this innovative idea – he was the first assistant of the cardinal. 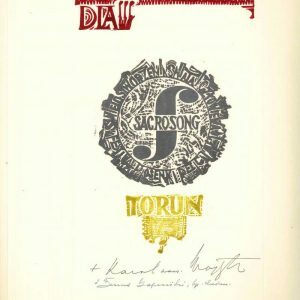 In 1969 he organised the first „festival of the creation of the world and human” under the name of „Sacrosong”. The cardinal Karol Wojtyła used to support this initiative for 10 years, protecting hundreds of its creators and performers against the attacks of the communist regime. 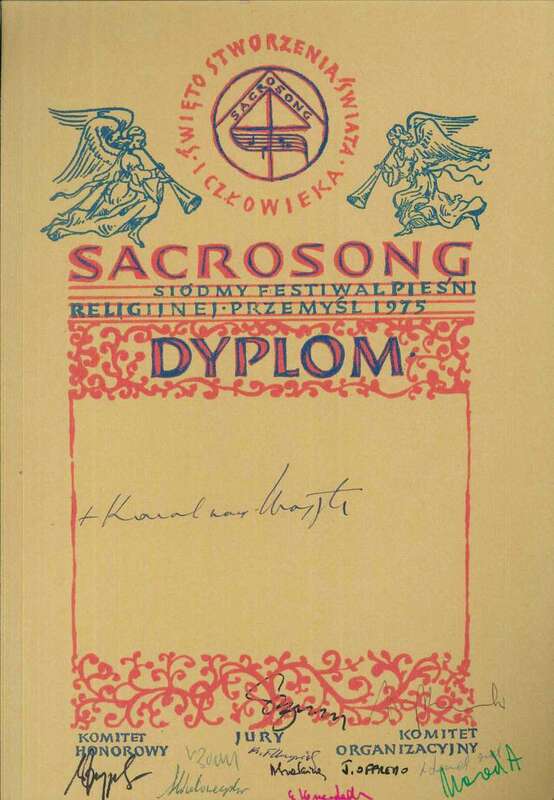 Afterwards, as a Pope, he wrote: „another youth movement in Poland I used to support, also financially, was „Sacrosong”. (Let’s rise and go, p.37 ). 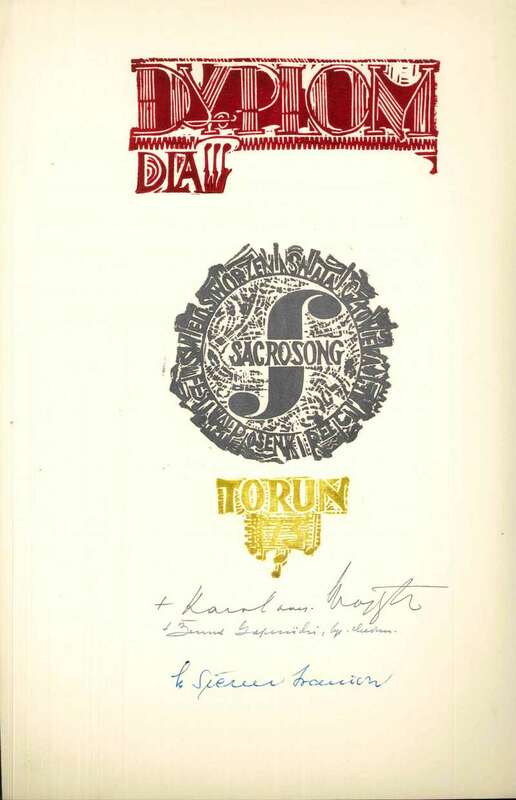 The „Sacrosong” motion spread in various forms. 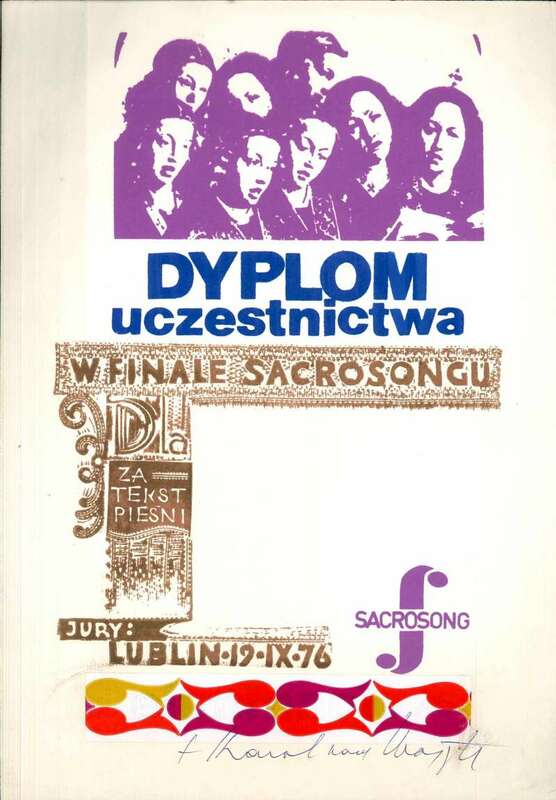 As the enthusiasts of this idea we set up in the Polish town of Rzeszów a symphonic singing and dancing group called „The Sacrosong Echo”. For the last 12 years we have been touring around Europe with this peace pilgrimage. In January this year we were in India, presenting our programme in Indian shrines and Christian churches. We invited also the representatives of other denominations to take part in this ecumenical service; the witness thereof was the Polish ambassador in Delhi. In this work of global dimension we draw the people’s attention to the 25 years of religious dialogue started in Assisi by John Paul II. In August 2012 our group consisting of 45 people is going to present the beauty of „Sacrosong” near the temples of New York so as to promote this day on the new continent. We would like to have the honour to present ourselves in front of the UN on this occasion. We would be happy if our concert could take place on 1st September 2012, which is the date World War II began. We would like to note that Poland, as the first country affected with the War, also contributed to the creation of the UN. Our voice in this organisation and in front of its members could contribute to the emphasis of the positive attitude and approach of the UN towards various denominations and religions. We suggest that the „day of creation…” become one of the topics of the UN peace mission. We would also like to note that full of concern about Highest Good we do not enter any financial contracts. We only count on voluntary offerings from those who appreciate our work. We have already arranged for our accommodation and upkeep in the churches where we are going to perform; among others, we have been invited to „Polish Częstochowa” to the festival in Doylestown, where we will perform on 2nd September 2012. We trust that the Blessed John Paul II still oversees the „Sacrosong” from his Father’s dwellings. May his mediacy protect the world against another war. We remain full of hope for the Secretary’s approval and favorable attitude towards our suggestion. Pope John Paul sang the Pater Noster in 1979 Sacrosong. All YouTubes of him singing there have been disabled, but this YouTube allows you to hear his much older self singing it.